The loudspeakers in your car are the last piece in the chain that takes the audio signal from your CD player to your ears and they can make or break the sound quality of your system. The best CD player money can buy will never live up to its potential if the car speakers are poor quality or badly fitted. New materials have come along and manufacturing techniques have improved, so reliability is better, but the basics of speaker design haven't developed much at all in the last decade or two. That certainly isn't because designers haven't been trying; they just haven't found a better way of getting the music to our ears. Contrary to popular belief, it doesn't necessarily follow that the more speakers you have, the louder the car audio system will be. It is the amplifier that largely dictates how powerful your system will be, not the speakers. More speakers do not necessarily mean better sound quality either. A few high quality "drive units" (as the individual speakers are sometimes called) will produce much better results than a door full of cheap ones. Even using a large number of good quality speakers can work against the overall sound because of phasing issues - this is something beyond the scope of our introduction here but good planning, installation and setting up is the answer. Speaker packaging will usually include a specification in Watts, but this simply refers to the electrical power they are claimed to handle before they are damaged. This is the speaker's "power handling" specification and always needs to be treated with caution. The main thing that dictates how well a car speaker reproduces a sound is the size, weight and rigidity of its cone - this is the part that vibrates as the electrical input (from the amplifier) is applied to it. As it vibrates it turns those electrical signals into sound waves. The smaller and lighter the cone, the faster it can move and so the better it will reproduce the high frequencies. On the other hand, reproducing low (bass) frequencies demands a lot of air movement and this can only come from a cone that is both big and strong (that is, rigid) enough to move a relatively large amount of air quickly and without flexing. You can see that one speaker won't be able to do both jobs well. 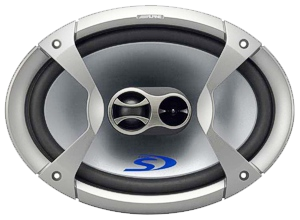 For this reason there are several different types of car audio speakers and speaker systems available. For car audio systems that hope to achieve anything like true hi-fi quality, there are two main options - Multi-axial speaker systems or Component speaker systems. Multi-axial means two or more separate speakers that share the same speaker chassis. Typically, there will be a small tweeter (high frequency speaker) mounted on a stand-off just above the centre of a larger woofer (low frequency speaker). This is known as a "co-axial" speaker. Others may integrate three speakers (tri-axial) and occasionally four (usually called 4-way or multi-axial, not quad-axial). The overall chassis may be anything from less than 4 inches across to 10 inches diameter and, although physically separate, all the individual speakers fit into one (or to be exact one identical pair, being stereo) compact, standard size chassis. The speaker positions (the cut-outs in the panels of the vehicle) conform to certain standard DIN sizes. Having said that, there are a lot of subtle variations and the speaker depth is not standardised. For this reason it is always best to consult your nearest MMSA member on which speakers will fit your car. A "Component Speaker System" will usually provide the very best results. Again, it is made up of several separate speakers, each designed to handle a specific group or 'band' of frequencies. Unlike the multi-axial types, component speakers do not share a common chassis and are physically separate from each other, allowing each speaker "drive unit" to be positioned for best results. This allows the larger car subwoofers (these provide the lowest bass frequencies and can be up to 18 inches in diameter or more, but typically 10-12 inches) to be installed where space allows, usually in the boot. The smaller mid-bass and midrange speakers and tweeters can be installed in the front doors, dashboard, A-posts or sometimes in the lower side footwell area. Wherever separate speakers are handling different frequency 'bands', some way of splitting the incoming music signal and sending it to each speaker is needed. This is called "filtering" the audio signal, and the device that handles this is known as the "crossover filter", or simply the "crossover". 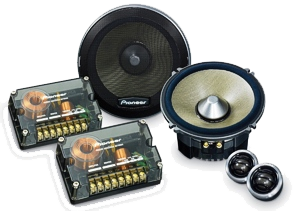 In multi-axial car audio speakers, the crossover is usually built in to the speaker chassis and is often simply a capacitor or a couple of electrical components at most. But with the component systems, the crossover network can be anything from a few components hidden in a small plastic box, to a very visible collection of higher quality components in a lavish perspex or metal case. These will have been designed to specifically suit the speakers they came with (you can't just take any crossover and use it with any combination of speakers) and are inserted in the speaker cable between the amplifier (or the CD player if its own built-in amplifier is being used) and the speakers. They do not require any kind of power supply and are therefore known as "passive" crossovers. Another form of filter network is the "active" crossover. This is sometimes in the form of a hideaway box with dials on the top of it, although nowadays quite a few CD players have a digital active crossover built in. Active crossovers must be inserted before the amplifier stage and their outputs often feed more than one car audio amplifier. An active crossover is a powered device (i.e. it needs its own 12 volt supply) with a more complex electronic circuit than the "passive" type, and allows a lot more variation in the settings. This gives more scope for getting the sound set up really well, but also adds the risk of getting things horribly wrong! Unless you're a knowledgeable car audio enthusiast, setting up or adjusting the settings of an active crossover is something best left to a specialist installer. Those wanting the very best sound, whether for competition or purely for their own enjoyment, will naturally be looking to use the best quality car audio speakers. It's the ideal starting point, but never forget that good speaker positioning and installation can make a world of difference. There isn't the scope here to cover the subject in any depth, but achieving a top-class sound in a vehicle is a fascinatingly interesting subject. The acoustics are complex and the inherent limitations of working in a vehicle present a challenge which many find completely absorbing. This is why you may have seen Autosound competitions taking place - something which has grown into a passion of car audio enthusiasts worldwide. There are many challenges when building a true hi-fi quality car sound system, but where you position the speakers for best stereo imaging and front-to-rear staging, how you physically install them, and how you setup crossover settings, equalisation and time alignment will set apart a fine sounding system from a great one. Many specialist installers have competition experience or have built high-class car audio demonstrators, so they are the guys to ask for advice.